So unbeknownst to you (this is a good thing), I carry on conversations between you and me all day long. I swear, it’s not as crazy as it sounds. Because my blog lives and explodes and wiggles around in my head 24/7, I’m always, and I mean always, thinking of things I want to talk to you about. Hundreds of things. Little things. Big things. All very important (like, the best hiding places to face plant into the bag of chocolate chips — that kind of important). I decided in order to calm to my psyche (and help me fall asleep at night), it was time to start a real, live series where I actually talk to you (in a very virtual sense) about the things that pop into my head. Think of this Let’s Talk series like you’re sitting at my kitchen counter, elbows on there and everything, and we’re chatting a million miles an hour — sharing tips and tricks and advice and maybe even throwing in a good dose of venting every now and then (and chocolate, there would be lots of chocolate, and muffins, if we were doing this in person). I’m hoping this series will be a laid-back way to share all the bits and pieces of kitchen and food and cooking-related things that come to my mind. There’ll probably be some video tips here and there, some help from a few of my favorite people in the world, and generally I hope it boils down to some good old-fashioned chit-chat that might actually be helpful when it comes to how you and I roll (and feel like rock stars in the kitchen). I’m so excited about some of the ideas I jotted down, it almost makes me giggle out loud. Aaah! So much fun. Today, I want to start with something simple. Spices. More specifically, the spices I keep on hand at all times. This obviously will vary based on how you cook and the cuisine(s) you make most often, but if you cook and bake from my site, the spices we talk about today will keep you happy and frolicking in the kitchen. You may even hear angels singing when you open up that spice cupboard, but as of yet, that can’t be 100% confirmed. Let’s back up a little. Can we be honest with each other? 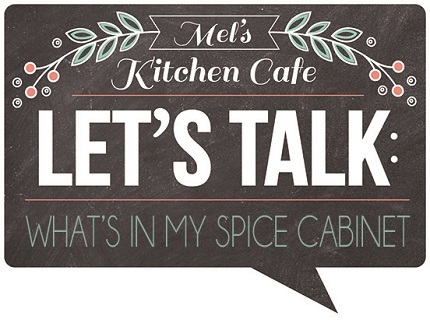 How long do you keep your spices a’hangin’ around in that little pantry or cupboard of yours? As I dug deep into the depths of my pantry shelves, I found a jar of red pepper flakes I’ve had for eight years. Eight. I honestly don’t even have a dignified explanation, especially since I’ve moved about four times in that period and you’d think I’d have done a mass clean out at some point. If you, like me, have spices that are expired. Toss them. I mean it. They’ll do you no good and a lot of times, they’ll give an off flavor to a dish (or just not pack the punch you need). Making sure your spices stay fresh and fragrant is very important. Now, I’m guilty of using up a jar of something or other if it’s only a month or so after the expiration date but if we’re talking month(s!) or years, just hold a hand over your eyes and throw them away. You can do it. I keep all my spices in a cupboard next to my oven/stove. 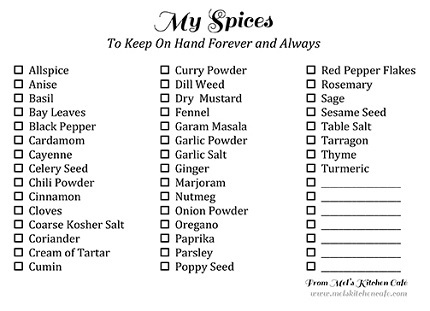 Here’s a simple printable with all the spices I keep on hand. I’d say 94.3% of these are everyday, common spices that I highly recommend keeping around. There are a handful that you may not need or use (marjoram, tarragon, turmeric) but I kept them on the list because well, I didn’t want to make two lists and figured you could filter through and decide which ones aren’t worth your time. I keep them all close to my heart. Print out the list, tape it to the inside of your cupboard or pantry and the next time you read a recipe that calls for coriander, go straight to your handy-dandy alphabetized list and scan for it. Yep! Coriander. It’s there and waiting. When I run out of a spice, I immediately put it on my shopping list. You could laminate this printable or stick it inside a sheet protector and use a marker to X out the box when you’ve run out. Then the next time you put together your grocery list, glance inside your cupboard door and make a note of which spices to get. It all depends on what spice/seasoning I need. 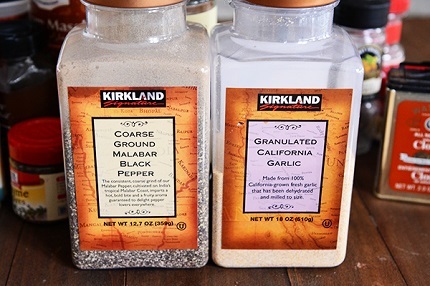 For those that I use constantly (namely coarse black pepper, coarse kosher salt, garlic powder), I grab at Costco because I use them in a very Costco-sized manner. Sometimes (too often) when I’m in a pinch and run out something that I need, like, yesterday, of course I just buy whatever brand is at the store. I’d say most often at the grocery store, I look for the McCormick (love their gourmet collection) or Spice Islands brands. I’ve also had great luck with the Archer Farms brand at Target and Trader Joe’s is always golden when it comes to spices (although their selection is limited). Since I know someone is going to ask me about generic brands, here’s my feeling: if you buy them and like the flavor and taste, by all means, use them! It really ends up being a matter of what you prefer and how much you want to pay. I tend to steer away from generic brands but only because I’ve had a couple experiences where the flavor was really off and it kind of scarred me and my taste buds (with paprika and chili powder and cinnamon). If I have planned ahead, Penzey’s spices is my go-to (no affiliation/unsponsored). I’ve waxed poetic about their sweet curry powder before but I buy a lot of my spices from there. The quality is magnificent and I notice a huge difference in flavor and potency. 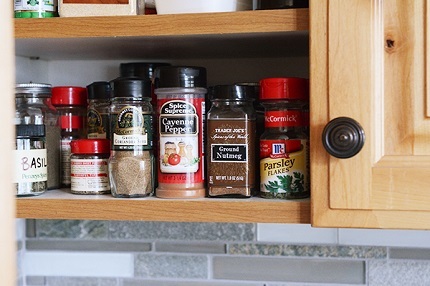 A well-stocked spice cabinet just might be your best friend in the kitchen. 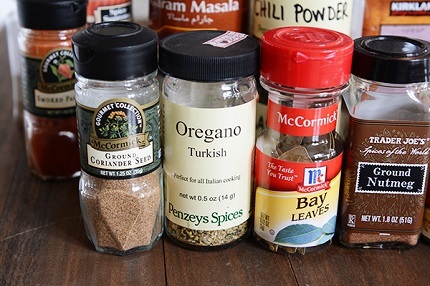 Not only does it save sanity when you go to make a recipe but it also gives you leverage to substitute and change things up now and then — if you’ve run out of one spice or just want to live life on the edge a little bit substituting cumin for chili powder (you crazy thing, you). My list is definitely not comprehensive but it includes the spices that I use all the time and that aren’t so out there, you’d have to sell your firstborn child to afford them (saffron, I’m talking to you). 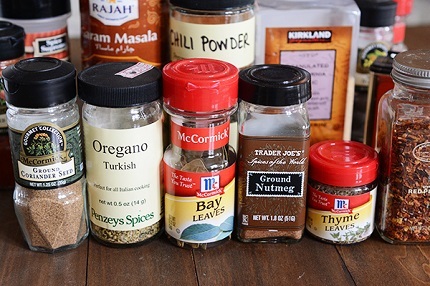 What are your go-to spices? Any that aren’t on my list? Now get on with it! Go plan a fun little afternoon and take inventory of your spice cabinet. It’s therapeutic, especially if you keep a bag of dark chocolate chips nearby. Also, stay tuned for the next Let’s Talk segment. It’s a doozy. I’m telling you, we have so much to talk about.